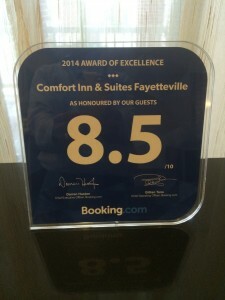 Little Rock, AR – March 20, 2015 – Pinnacle Hotel Group’s Comfort Inn & Suites, Fayetteville, AR received their first Booking.com 2014 Award of Excellence. Comfort Inn & Suites received an average review score of 8.5 out of 10 and is one over 18,000 properties in America to receive the 2014 award. Click here to read more on the Booking.com website. Booking.com is the world leader in booking hotel and other accommodations online. It guarantees the best prices for any type of property – from small independents to five-star luxury. Guests can access the Booking.com website anytime, anywhere from their desktops, mobile phones and tablet devices, and they don’t pay booking fees – ever. The Booking.com website is available in 42 languages, offers over 590,000 hotels and accommodations including more than 200,000 vacation rental properties and covers over 70,000 destinations in more than 200 countries worldwide. It features over 42 million reviews written by guests after their stay, and attracts online visitors from both leisure and business markets around the globe. With over 17 years of experience and a team of over 8,300 dedicated employees in 150+ offices worldwide, Booking.com operates its own in-house customer service team, which is available 24/7 to assist guests in their native languages and ensure an exceptional customer experience. Learn more at http://www.booking.com.